AUSTIN, Texas, Nov. 9, 2017 /PRNewswire/ -- Veterans Day is this Saturday, November 11, and restaurants and stores across the country want to thank those who have served by offering an array of deals and freebies. 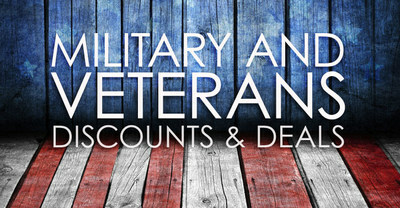 To see a complete list of the 30+ Veterans Day deals, visit the RetailMeNot Blog, The Real Deal. Discounts range from BOGO meals and 15% off merchandise to complimentary haircuts and free doughnuts. Some retailers and restaurants require a military ID to claim the offer, while others are on the honor system and simply take the patrons' word regarding military status. Below are the top 5 deals this Veterans Day. Note that some are valid on Friday and others on Saturday. That means two days to enjoy the free fare! Enjoy a free meal from a special menu available to veterans and active military. Military ID or proof of past service is required. Get a free doughnut—no purchase necessary. Veterans and active military can enjoy a free stack of red, white and blue pancakes. Also, for the entire month of November, IHOP will donate $1 from every purchase of red, white and blue pancakes to the Fallen Patriots Foundation. On Veterans Day, customers who go to a U.S. Great Clips salon will receive a free haircut card to give to an active/inactive/retired military member. Veterans can also visit any U.S. Great Clips salon on November 11 to get a free haircut that day or a free haircut card to use later. Haircuts are redeemable until December 31. Customers with a valid military ID get 15% off in-store purchases from Saturday, November 4 through Saturday, November 11.